Although LA Unified stands to potentially have its highest graduation rate ever this year, the district doesn’t want students to settle for D grades. 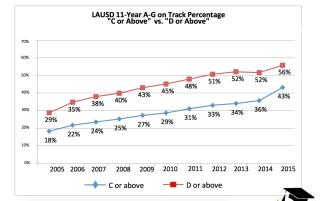 In fact, the percentage of students maintaining a C or better in college prep or A-G classes has more than doubled in 10 years, according to the latest LA Unified statistics. In a report presented at a committee meeting Tuesday afternoon, Chief Academic Officer Frances Gipson noted that only 18 percent of the students had a C or above in 2005, but in 2015 that number hit 43 percent — a nearly 20 percent jump just from last school year — and this year it is expected to hit 49 percent. Gipson repeatedly used the phrase “cautious optimism” when discussing the recent numbers with both the school board members and later with LA School Report. She said part of the reason for the new statistics and the optimistic outlook is “an action plan for incredible personalization” that was implemented by new Superintendent Michelle King when she took office last month. In her first meeting as superintendent, King let her local district superintendents know that they should all be personally accountable for contacting students who are not on track to graduate. Staff was notified to help students get into credit recovery programs so they can turn F grades into passing grades. Although the district lowered standards so that students can also graduate with D averages in A-G classes, that is not enough for King. “You can receive a D to graduate, but we are looking toward the C college-ready achievement, and we would be very pleased to look at how we moved the needle for our kids to make them more college ready,” King said. In the latest statistics, 63 percent of seniors districtwide are on track to graduate, and 17 percent are off by one or two classes, according to Gipson. The remaining 20 percent need to complete three or more courses. In order to help those students, the district has 138 auxiliary classes and also offers independent study, blended learning, virtual learning and other individualized programs. At the moment, about 700 students are enrolled in Performance Assessment Student Support (PASS) in-class programs at 28 schools, and 330 have participated in the Students Taking Action for Readiness (STAR 17) program that gives extra instruction and testing time for students who need it. Since August, more than 4,000 students have enrolled in after-school classes at 38 high schools with 1,213 semester courses currently completed. Local District Northeast Superintendent Byron Maltez gave a presentation showing how his district is working with students who are lagging behind. He said they have better ways of identifying and targeting the students now and offer unique individual programs. If students can’t make Saturday or after school programs and have trouble while on computer courses at night, Verdugo High School, for example, has hired a teacher available from 7 p.m. to midnight to answer questions. And San Fernando High School arranges counseling support for students who may have social or emotional issues that prevent them from performing well in class. Ratliff said she wants to make sure that students in the credit recovery program are getting the same kind of education. “We want to make sure that ultimately the diploma is the same for everyone,” she said.